Infant Baptism is for children between the ages of 0 – 6 years. Baptism is the first Sacrament of Christian Initiation. For an infant child to receive Baptism at Holy Trinity Parish, his/her parent(s) or legal guardian(s) must be registered and actively participating in the life of a Catholic parish. Active participation at Holy Trinity Parish is defined and understood that the parent(s) or legal guardian(s) weekly worships during Sunday Mass as is his or her privilege and responsibility, and participates in parish community life through stewardship (time, talent, and treasure). The Pastor conducts the Baptismal Preparation Class. Please call the Parish Office (330) 385-7131 in order to schedule an appointment with the pastor during the pregnancy or after the child is born. Parent(s) and or legal guardian(s) is asked to choose someone to serve as godparent for his or her child. A parent or legal guardian must choose at least one godparent. If you should choose to have two godparents, they must be one male and one female. A godparent must be registered at a catholic parish, baptized, confirmed, at least at the age of 16 and if married, the marriage must be recognized as valid in the Catholic Church. If a godparent is not a member of Holy Trinity Parish in East Liverpool, Ohio, a written confirmation signed by the pastor of the parish where the godparent belongs, must be provided to the pastor of Holy Trinity Parish before the date of baptism can be scheduled. A sponsor is a baptized person of another Christian faith who may serve as a witness to baptism, as long as one godparent fulfills all of the above mentioned requirements. Such person can not be a replacement of the godparent. The sponsor needs to provide written verification of his or her baptism and also submit this to the pastor of Holy Trinity Parish. The baptism of a child cannot be denied however it may be delayed. If there is no reason to believe that parent(s), legal guardian(s), and godparent(s) may carry out the responsibilities of raising the child in the faith of the Church, delay in Baptism may be necessary to allow the responsible adults the opportunity to grow in faith. 1. 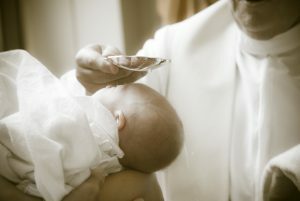 Contact the pastor of the parish where they are currently registered and express their wishes to have their child baptized outside of their parish boundaries. 2. Attend the baptism class at their own parish. 3. A written permission from their pastor must be sent to the pastor of Holy Trinity Parish. 4. The date for baptism may be scheduled after all of the above requirements are met. We encourage everyone, regardless of the age, to partake in an ongoing education and formation through prayer, reading, and discussion.